Hand-selling is what I call it when I believe I know the perfect book for a child. I couldn't resist doing this with my students, my son and my friends' kids. Yes, I truly believe children are more likely to love reading when they make their own choice of reading material. But there are times when kids might have a prejudice about a certain genre, or be blinkered to anything other than books about tractors or unicorns. Hand-selling is when I do my best to tell a child what will appeal to him about a book. And then he gets to choose for himself. With me trying hard not to look disappointed if he doesn't choose the book I love! How NOT to hand-sell: Don't give a rambling recollection of the book. This is the verbal equivalent of a slide night. "There's this boy, see, and he has a dog, well, he has a cat too and the cat is so funny, makes all these jokes but the dog is good too, you'll love him. His name's Snap, not the boy but the dog. The boy is Jake. The cat's name is Tiddles. Or is it Puddles? Oh, never mind. Now where was I?" 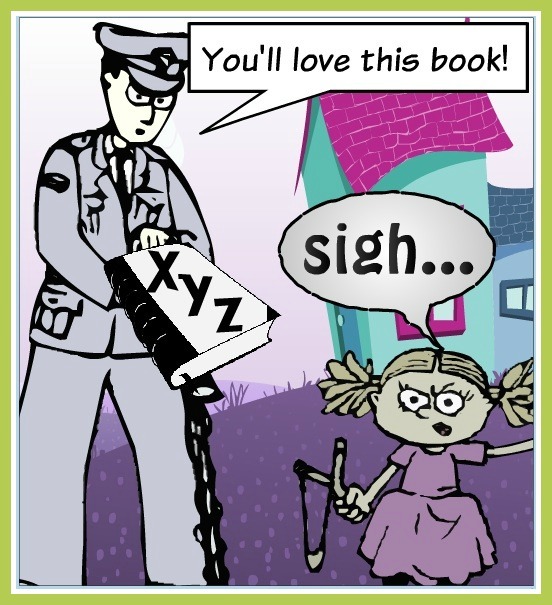 * Use your knowledge of the child to explain why you believe he will enjoy this book. Has he read a book with a similar theme? Does he like the subject matter? Did he express a love for humour in books? Is he a reluctant reader looking for lots of white space, large print and quirky illustrations. * Show her the book in question. Let her hold it and leaf through it. This helps her make a visual and physical connection with the book. * Keep your description short and to-the-point. Think back cover book blurb, not Gone with the Wind. Hone right in on the features that will appeal to this particular child rather then re-telling the plot. Do you hand-sell books to your kids? Any tips for the rest of us? What works for you? Find similar articles at The Book Chook by clicking Reading in the right sidebar. great tips! I do it more with my nephews. They are older. But I have started doing it a bit with my 3 year old. Of course, my 3 year old is actually decent at "selling" to me too on the occasions when I doubt his book choices at the library! @Jo Great tip! We'll have to enrol Postie in our National Year of Reading! @Jackie H.Oh, I love the idea of a three-year old hand seller of books! Good on him! I generally don't say anything to my kids to try to get them to read a book, but I use careful product placement. When it's time to sit down for reading time, I'll cover our ottoman with maybe ten books that I think they'd like, a mixture of books they selected from the library and books I selected for them. I also have book boxes for each of my kids that contain a mixture of books they selected from the library and books I think they'd enjoy. Ultimately the kids choose which book to read at any given time, but I think they read and discover that they enjoy a broader selection of books when a broad selection of books is offered. @delightfulchildrensbooks.comCareful product placement is an excellent way to describe it, Amy! I like the idea of a broad selection of books. Thanks for sharing your method with other parents! @Wise Owl FactoryGood point Carolyn! Something about a prophet in her own country perhaps? I absolutely "hand sell" books to library customers, where a librarian recommendation is often appreciated, but never at home, where a mom recommendation is the kiss of death! @shelf-employedI think I'm detecting a bit of a theme here! I once tried reverse psychology with my son, scorching a book I secretly wanted him to read. Didn't work! I sell children's books at a boutique so I often hand-sell books to children. Sometimes that means stepping in and gently guiding the parent towards letting the child pick out their own books. This weekend it was a well-meaning Dad who told his 5 year old son that the picture books he was looking at were too young for him. When I reassured the father that his son was within the recommended age range for those books he relaxed and let up. They both picked out a copy of Jack and the Beanstalk (grade level 2) as well as a chapter book and a coloring book. Lucky Boy! @NicholeHow lucky that you were there to explain to the dad, Nichole. I love picture books, and wish this nonsense about kids not reading them after a certain age had not begun.